23mm x 35mm stainless steel case, stainless steel back, non-screw crown with 1 o-ring, domed sapphire crystal with anti-reflective coating, white dial, quartz Montblanc 4810/107 movement with triple-folding buckle, polished stainless steel bracelet. Water resistant to 3 bar (30 m). 23mm x 35mm stainless steel case, stainless steel back, non-screw crown with 1 o-ring, domed sapphire crystal with anti-reflective coating, black dial, quartz Montblanc 4810/107 movement, black detachable starisma calfskin strap with pin buckle. Water resistant to 3 bar (30 m). 23mm x 35mm stainless steel case, stainless steel back, non-screw crown with 1 o-ring, domed sapphire crystal with anti-reflective coating, white mother-of-pearl dial with crossover numerals at 3, 6 and 9 o'clock and a Montblanc Diamond (~0.1 ct) at 12 o'clock, quartz Montblanc 4810/110 movement, white alligator strap with triple-folding buckle. Water resistant to 3 bar (30 m). 23mm x 35mm stainless steel case, stainless steel back, non-screw crown with 1 o-ring, domed sapphire crystal with anti-reflective coating, black mother-of-pearl dial with crossover numerals at 3, 6 and 9 o'clock and a Montblanc Diamond (~0.1 ct) at 12 o'clock, quartz Montblanc 4810/110 movement, black alligator strap with triple-folding buckle. Water resistant to 3 bar (30 m). 23mm x 35mm stainless steel case, stainless steel back, non-screw crown with 1 o-ring, domed sapphire crystal with anti-reflective coating, white dial, quartz Montblanc 4810/110 movement, anthracite-coloured detachable starisma satin strap with pin buckle. Water resistant to 3 bar (30 m). 23mm x 35mm stainless steel case, stainless steel back, non-screw crown with 1 o-ring, domed sapphire crystal with anti-reflective coating, white dial, quartz Montblanc 4810/110 movement, brown detachable starisma satin strap with pin buckle. Water resistant to 3 bar (30 m). 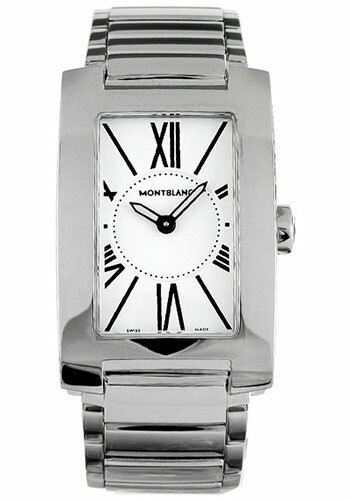 23mm x 35mm stainless steel case, stainless steel back, non-screw crown with 1 o-ring, domed sapphire crystal with anti-reflective coating, white mother-of-pearl dial with crossover numerals at 3, 6, 9 and 12 o'clock, quartz Montblanc 4810/110 movement with triple-folding buckle, polished stainless steel manchette bracelet. Water resistant to 3 bar (30 m). 23mm x 35mm stainless steel case, stainless steel back, non-screw crown with 1 o-ring, domed sapphire crystal with anti-reflective coating, white mother-of-pearl dial with crossover numerals at 3, 6, 9 and 12 o'clock, quartz Montblanc 4810/110 movement, pink alligator manchette strap with pin buckle. Water resistant to 3 bar (30 m).